QuickWave allows watching signals directly in the time domain like it is done in a measurement technique called Time Domain Reflectometry (TDR). The TDR-like signals can be extracted directly from the QW-3D simulations. 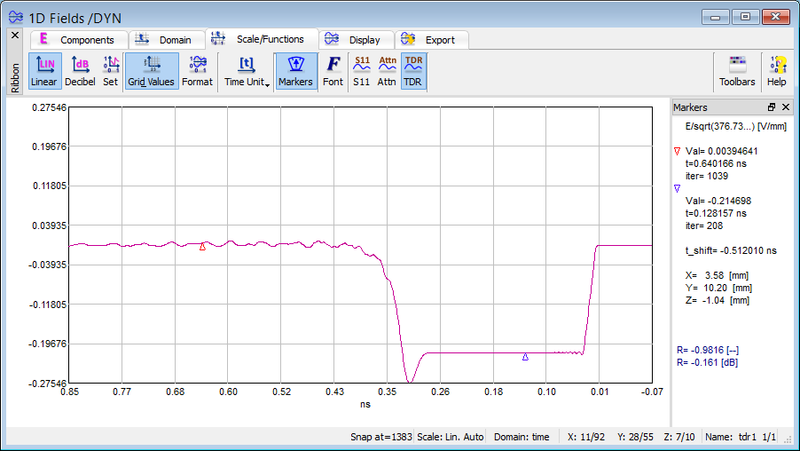 The TDR functionality is available via TDR function in 1D Fields window. This option allows for virtual measurements of reflection coefficient at any point in time. The reflection coefficient is presented as R value in both, linear and dB scales. The TDR option gives also the possibility of measuring the location of the discontinuity, namely the distance between the field testing point and the discontinuity. Thus the TDR functionality allows for locating the discontinuity and determining its character. See also online documentation about Time Domain Reflectometry.